Lt. 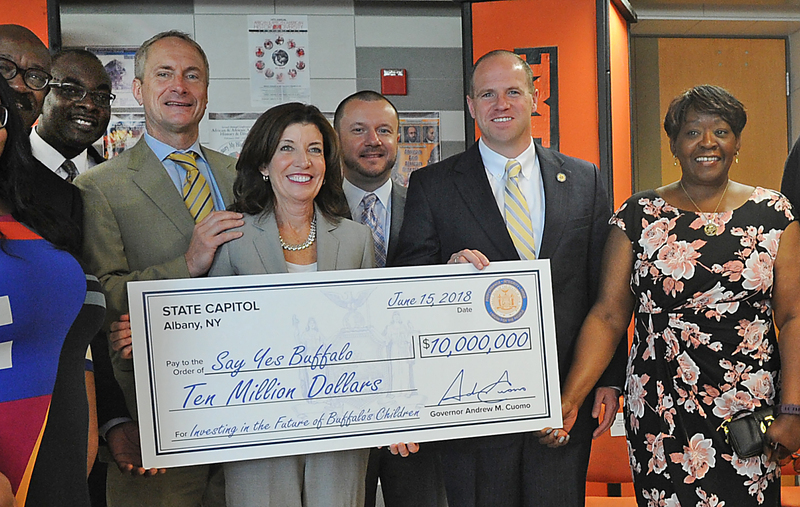 Governor Kathy Hochul presents Say Yes Buffalo with a $10 million check. Say Yes Buffalo provides scholarships and grants to eligible graduates of Buffalo public and charter schools to all State University of New York (SUNY) and City University of New York (CUNY) and to nearly 100 private colleges and universities. Eligible students who enroll at a Say Yes participating college will receive a scholarship to cover up to 100 percent of the cost of tuition after federal, state and institutional aid has been applied. As part of an agreement between New York State and the Say Yes Buffalo Scholarship Fund, $10 million in funding from the Buffalo Billion II initiative is being used to provide endowment support to the Say Yes Buffalo Foundation to ensure this program continues in perpetuity. It is also assisting Buffalo students with the non-tuition costs of attending college. Funds are being used to bridge the gaps between Say Yes Buffalo and New York’s Excelsior Scholarship program to cover books, fees and other non-tuition expenses for Say Yes Buffalo scholars with the most need. In return, Say Yes will continue to provide tuition scholarships for all Buffalo students to attend state institutions, given they meet eligibility requirements. Funding is being disbursed to Say Yes. Read about Say Yes Buffalo's success in its 2017-2018 Report to the Community. Funding for Say Yes through the Buffalo Billion II is an important part of our strategy to invest in the future of the region’s workforce and prepare students for new jobs being created in Buffalo and across Western New York. A college education is essential to succeed in today’s economy, and financial barriers should not serve as a roadblock for any prospective students. Say Yes is a landmark collaborative model based on a successful national initiative that has helped to boost graduation rates and post-secondary attainment rates in cities across the nation.